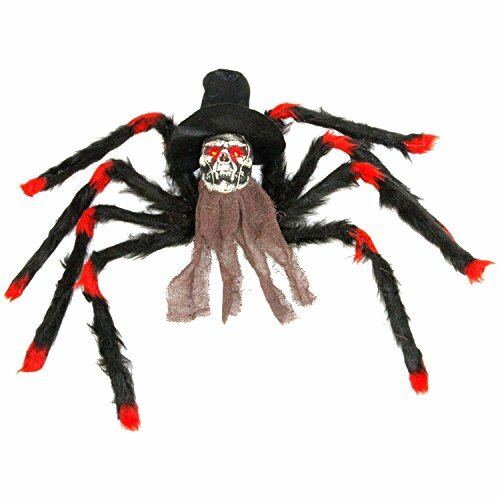 Add some extra fright to your night with this creepy crawly 32" spider with a human skeleton skull head body. Black and red fury haired large creepy spider with light-up flashing evil LED eyes. The skull head is wearing a hat and it also has a grey creepy cloth beard. Those that are affected by arachnophobia will have spine tingling fright when they come across this oversized spider. Legs can be bent into any position. Perfect for placing in a web or hanging it from the ceiling, in plants, on the front porch or almost anywhere. Ideal for haunted houses, halloween parties or just as a prank! Add some extra fright to your night with this creepy crawly 32" spider with a human skeleton skull head body. Black and red fury haired large creepy spider with light-up flashing evil LED eyes. The skull head is wearing a hat and it also has a grey creepy cloth beard. Those that are affected by arachnophobia will have spine tingling fright when they come across this oversized spider. Legs can be bent into any position. Dimensions: 32" Spider with legs fully extended. Eight 15" long furry posable legs. Skull head body is 5" long x 3" wide x 7" high. Battery Operated.